Base adulation of the leader and enforced ideological conformity were inseparable from the atmosphere of fear and intimidation fanned deliberately beginning in 1928. In March 1928, fifty-five engineers and administrators of the town of Shakhty in the coal-mining region of Donbass were arrested on charges of sabotage, allegedly sponsored from abroad. They were accused of trying to disrupt the operation of the coal industry and cause workers’ unrest. At the public show trial that followed many of the defendants were made to confess their alleged crimes. Eleven death sentences were served, five of which were carried out. The rest of the alleged saboteurs received long prison sentences. The Shakhty affair set a precedent and a pattern for future demonstrative denunciations and show trials. It has now been established beyond doubt that the whole affair was fabricated by Stalin’s secret police. Most probably, Stalin used it to infuse the political life with elements of social confrontation to drum up support for his radical economic measures. 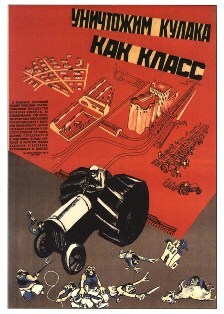 The trial enabled him to discredit Bukharin’s plan of class cooperation and counter it with the diametrically opposite idea of the intensification of class struggle. Stalin claimed that resistance of the enemies of the Soviet power would only intensify with the country’s advance toward socialism. The population should be constantly vigilant against concealed wreckers and saboteurs, whose activities were allegedly directed by the capitalist West. From 1928 on official propaganda spared no efforts in driving home the perverted logic of the “intensification of class struggle”: as socialism is getting stronger, its enemies do not wish to surrender. Instead, they strive to unite and put up growing resistance; they are like mortally wounded animals, which are especially dangerous. But equally dangerous are all those who do not appreciate the new policies or dread them; all those who lack faith and spread panic should be dealt a shattering blow, regardless of the posts they occupy. Stalin’s ominous theory prepared the population psychologically for the moment when he would point his accusing finger at leaders who strayed from “the party line” and thereby obstructed the nation’s progress toward the shining goal of socialism. It enabled the regime to maintain constant ideological tension in society. The tiniest shades of dissidence, diverging views, and independent opinions were relentlessly smashed. From 1928 until the end of Stalin’s period in power, stage-managed witch-hunts and show trials against alleged “enemies of the people,” fabricated jointly by the secret police (known by the Russian acronyms OGPU and, from 1934, NKVD) and judicial bodies, practically never ceased. These horrendous activities were designed to maintain the “enemy image,” which lay at the heart of the system of ideological terror and intimidation used to enforce complete ideological conformity of Soviet society.